We had dinner at Marcus’ and Tracey’s on Saturday night and guess what – she was cooking Thai. Marcus said Tracey was a bit anxious cooking Thai food for me and Bob. She should not have been worried – the food was yummy. 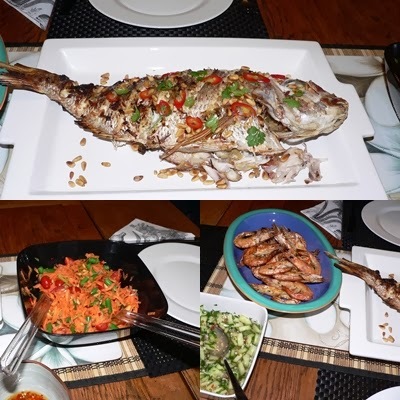 We had grilled whole snapper with lemon grass, grilled prawns with tamarind sauce and fantastic Carrot Som Tam (Thai spicy carrot salad) and divine coconut rice. I could have stuffed myself with the latter two happily and nothing else but the snapper and prawns were also irresistible. Thai cuisine has become widely known internationally in the past 30 years or so – and it is wonderful to witness its popularity in a home cooking ambience. Many food snobs might have cried for authenticity but I beg to differ. Food evolves all the time – haven’t we fried spaghetti with chilli, salted fish and basil in Thailand and people applause the adaptation? 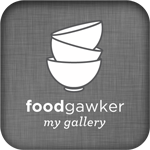 People cook food the way it suits their palate. Even mega fast food chains like KFC and Macas have to add special Thai-ish options to their menu to suit Thai palate and entice Thai consumers. And just coming back from Thailand after a month long visit – a lot of Thai food dishes in Thailand have also changed – both in tastes and appearances. Mind you, Asia, including Thailand did not know chillies until introduced by the western navigators/traders a few centuries ago. So, IMHO, authentic cuisines should not be oh so sacred. We do not have all the ingredients for Thai food readily available here in New Zealand so we have to improvise – even for Thais. As long as you have a good palate and good ingredients (that can be improvised), you can cook yummy food of any nationality I think. So well done Tracey and Marcus – can’t wait for your next Thai dinner! I’ll ask Tracey to share her recipes with us, especially the coconut rice – there are so many Thai dishes that go well with it. I’ll post the variation here sometimes.